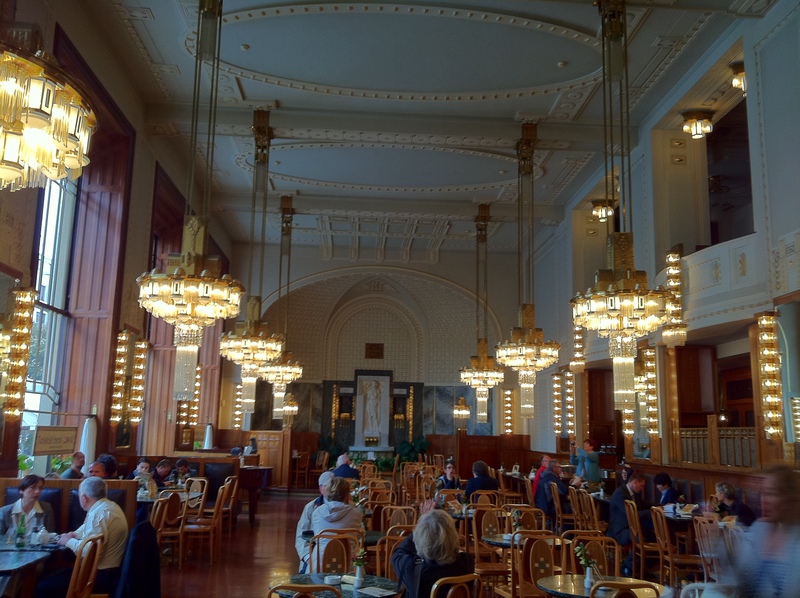 Several of us decided to breakfast fairly early today; we had the day free until the rehearsal in the Rudolfinum at 4pm. 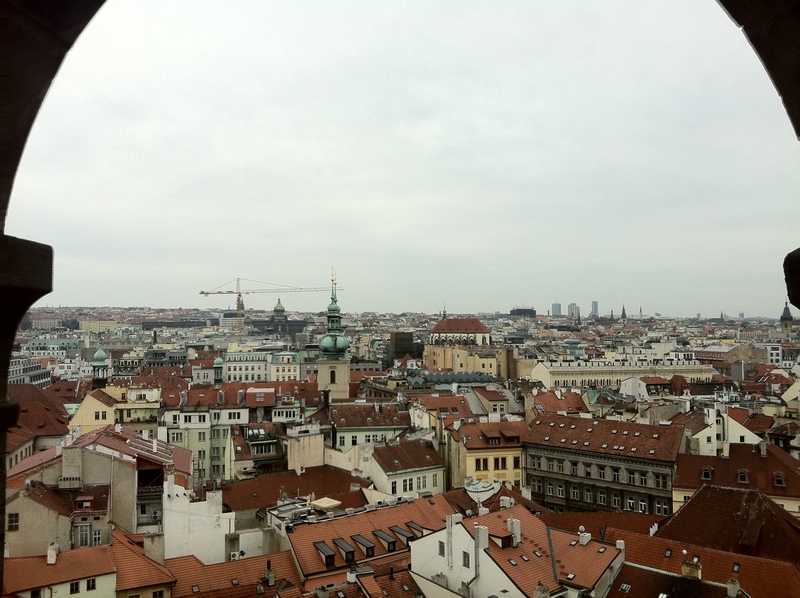 An opportunity to explore Prague was not to be missed! We went down to the dining hall in the hotel only to find ourselves sharing the hall with a few hundred delegates from a Defence & Security conference. This was a nightmare; it was impossible to get to any of the food, never mind enjoy a nice tranquil start to the day. The noise was too much. 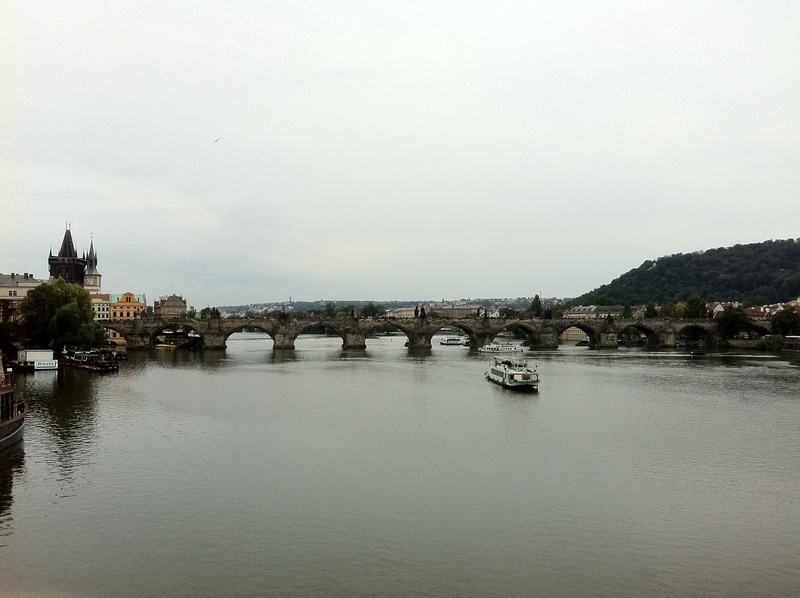 Therefore, Chris Morley, Steve Nicholls, Simon Griffiths (all three from the French Horn section) and myself elected to catch the Metro into Prague’s, beautiful Old Town to enjoy a morning meal there. 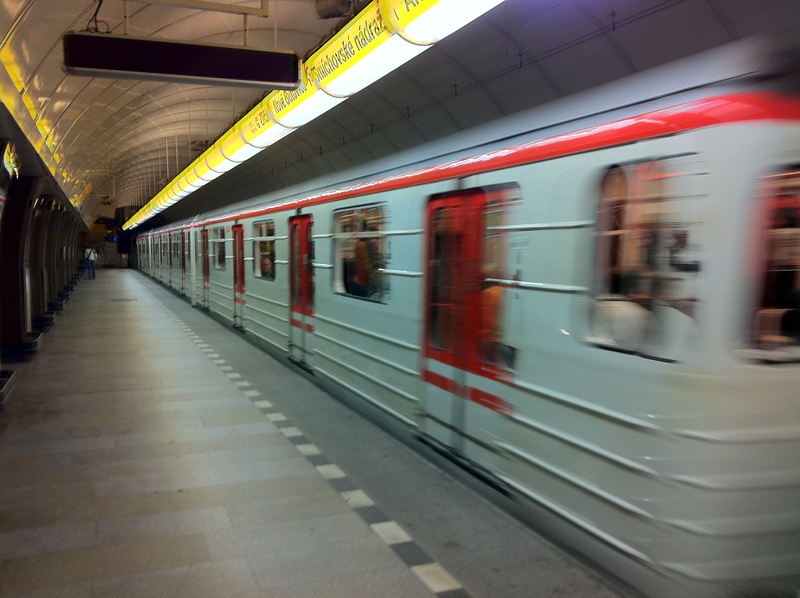 The metro station was right under the hotel and called Vyscocanska. I can’t place type the unusual Czech accents due to my lack of skills on the keyboard and anyway, the difficulty of the Czech language will probably always leave me completely bewildered! 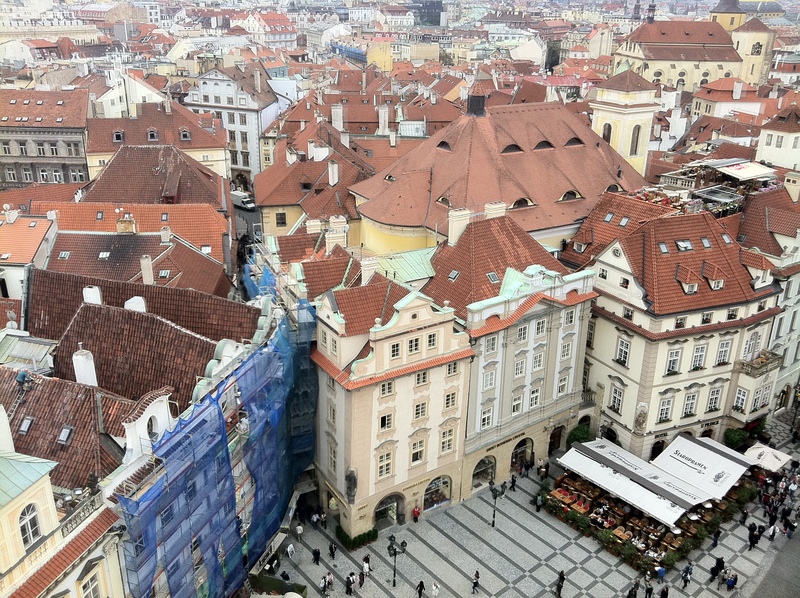 We travelled the ten minute journey to Namesti Republiky and deciced to breakfast at the spectacular Obecni Dum. The Obecni Dum is the most prominent Art Nouveau building in Prague. 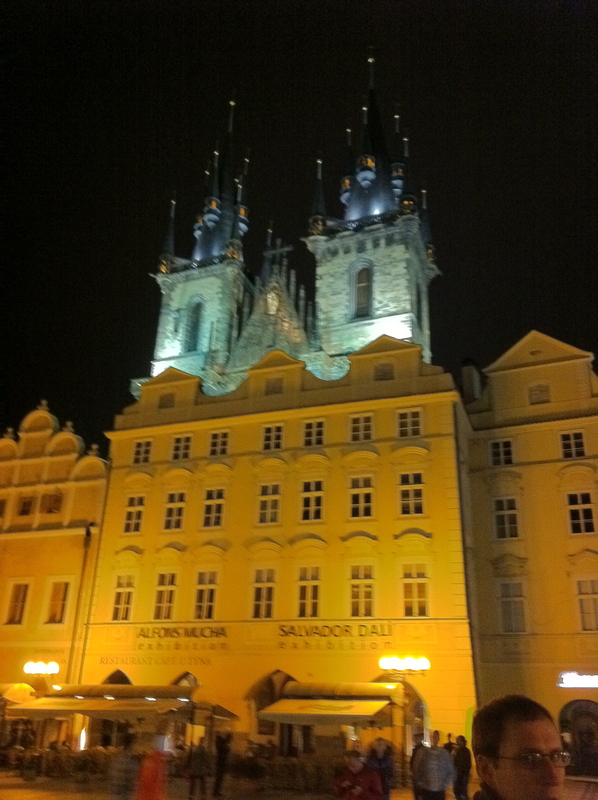 It is located in the heart of the Old town and adjoins the famous Powder Tower. 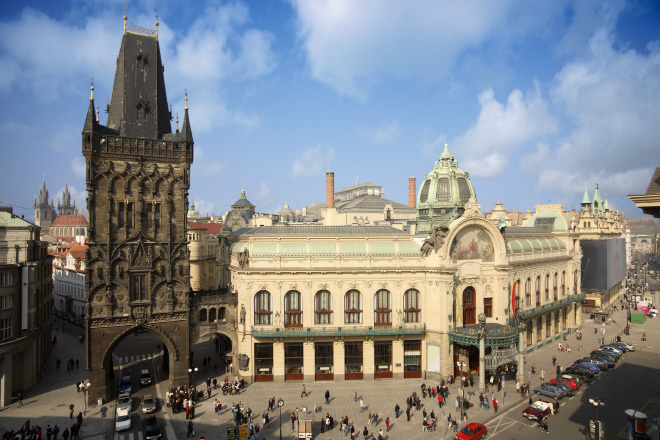 Apart from one of the most beautiful restaurants in the world the Obecni houses the famous Smetana Hall; the other famous concert hall in Prague. 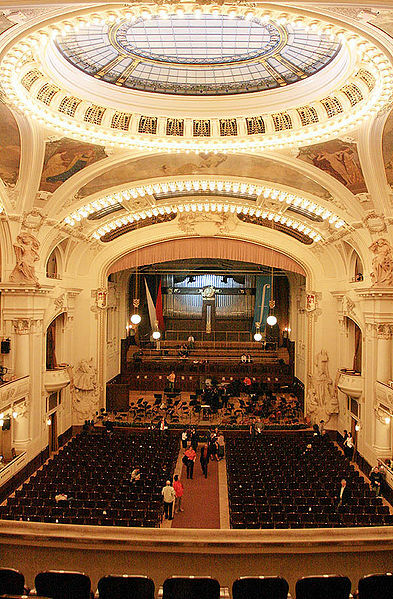 It houses the Czech National Orchestra and an audience of 1200. We chose a variety of options from the menu and marvelled at the splendour and style of this great city. 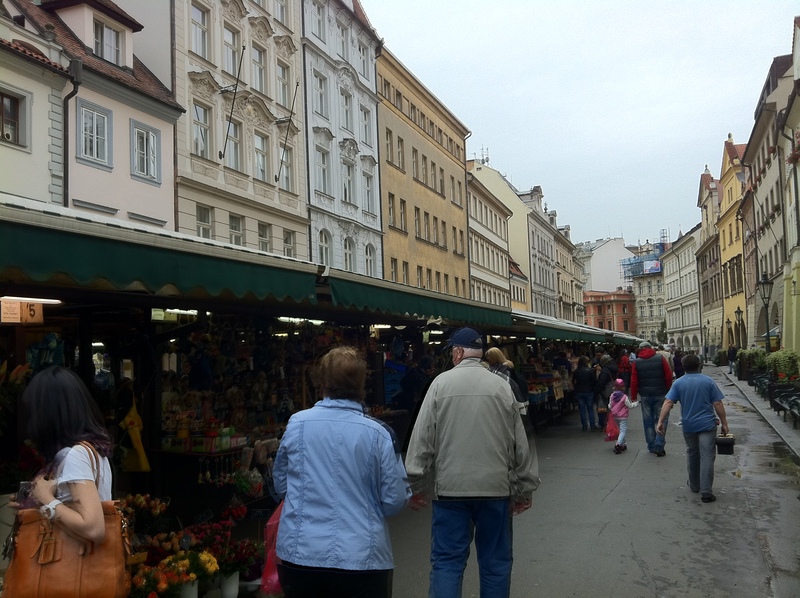 Well fed now, we wandered through the romantic old streets and headed to Prague’s Old Town Square. We had watched the Astronomical Clock the previous evening, but wanted to see it in the light of day. There was a substantial crowd assembled there already but we managed to grab a space amongst the tourists for the display. They are accompanied by a trumpet fanfare, played by a lone trumpeter in costume from the top of the tower. 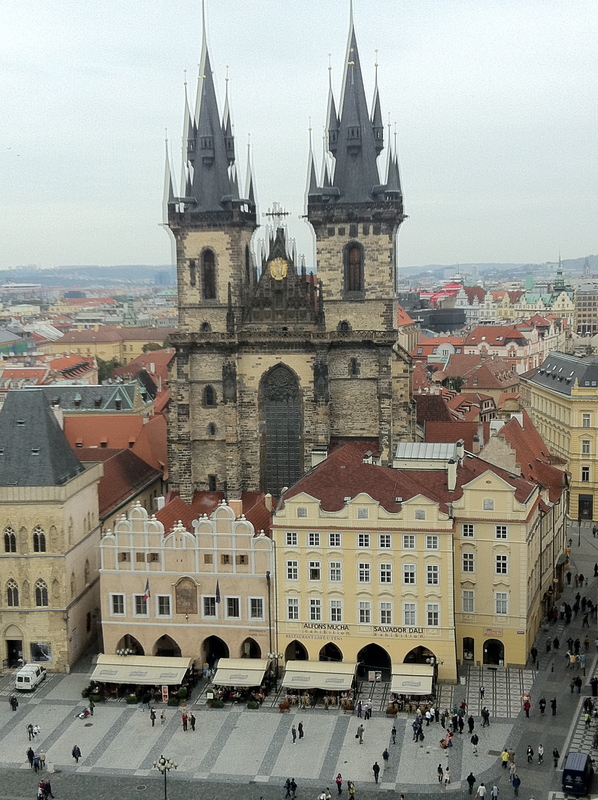 His fanfare is then replicated by another trumpeter on the top of the Tyn Church over the other side of the square. 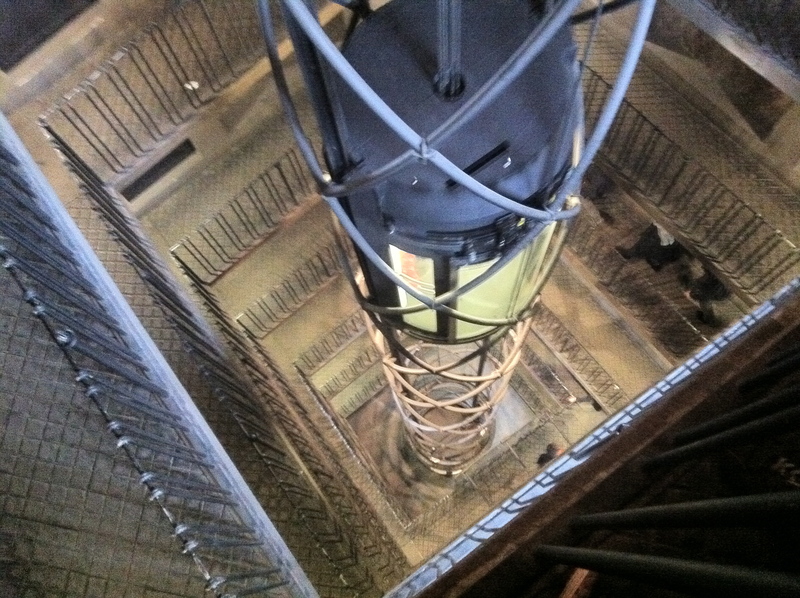 A nearby member of the public informed us that we could go up to the top of the tower, where the trumpeter had played, and see some of the best views of the city. Off we went! We then made our way across the bustling Old Town Square, past the busy cafes , bars and horse drawn carriage tours to the aforementioned Church of Our Lady Before Tyn. 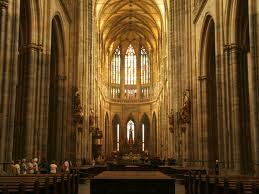 This Gothic church, built around 1365, boasts one of the most spectacular interiors I have ever seen. The outside of the church is no less amazing and the roof can be seen spiralling upwards magnificently on the Prague skyline. This, in a place known as the ‘City of a thousand spires,’ too. 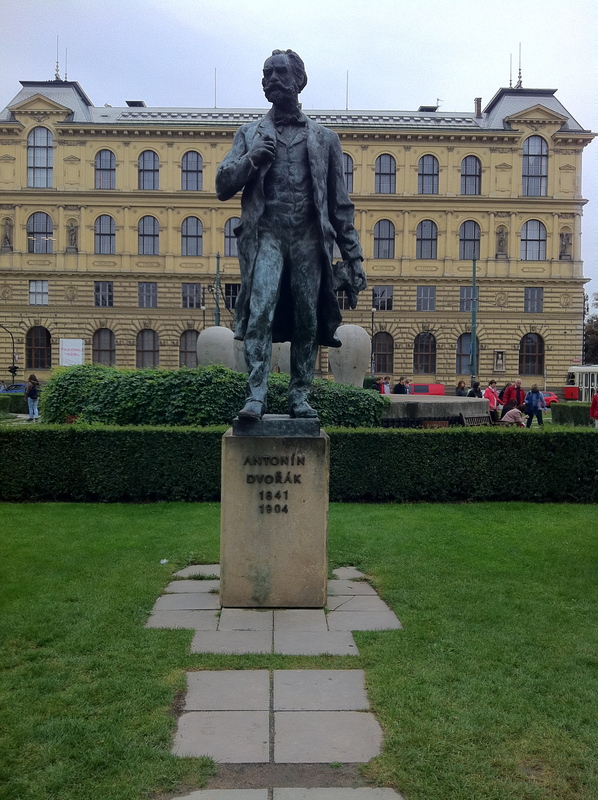 It was now getting on towards lunchtime so we thought we had better drop off our instruments etc at the nearby Rudolfinum, before exploring further. We did not need to be carrying all this baggage around Prague with us. 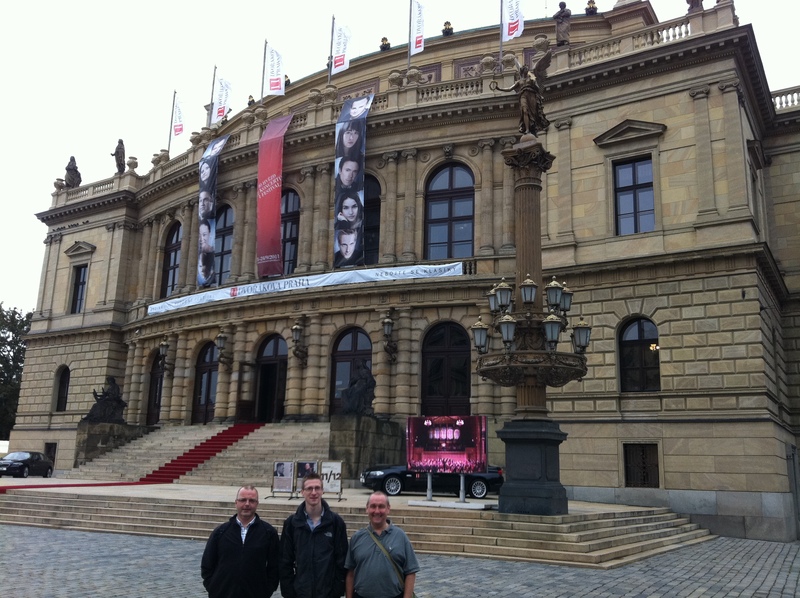 The Rudolfinum houses the magnificent Dvorak Hall; where the RLPO would be playing later that evening. 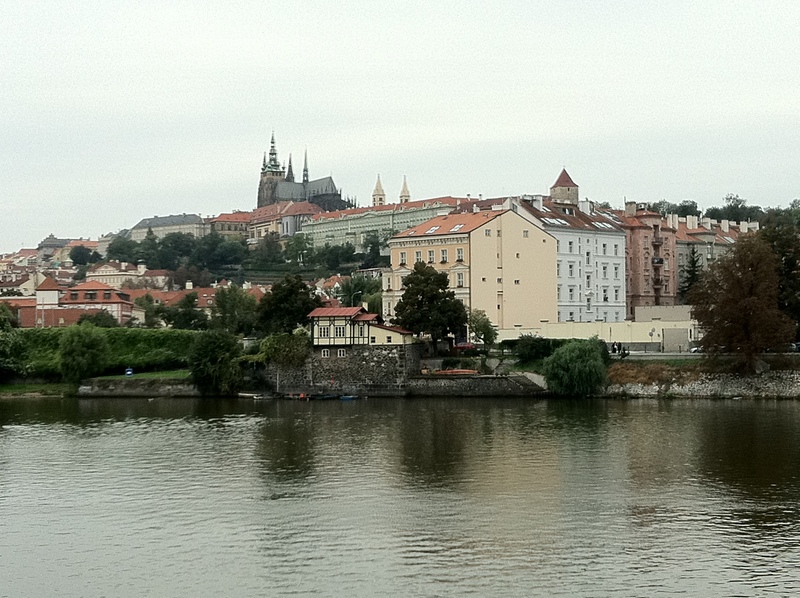 It is situated down by the famous Moldau/Vltava river that Smetana composed that wonderfully evocative music about. There are spectacular views from the Rudolfinum; not only of the water, but of the Castle, St. Vitus’s Cathedral and the Charles Bridge. 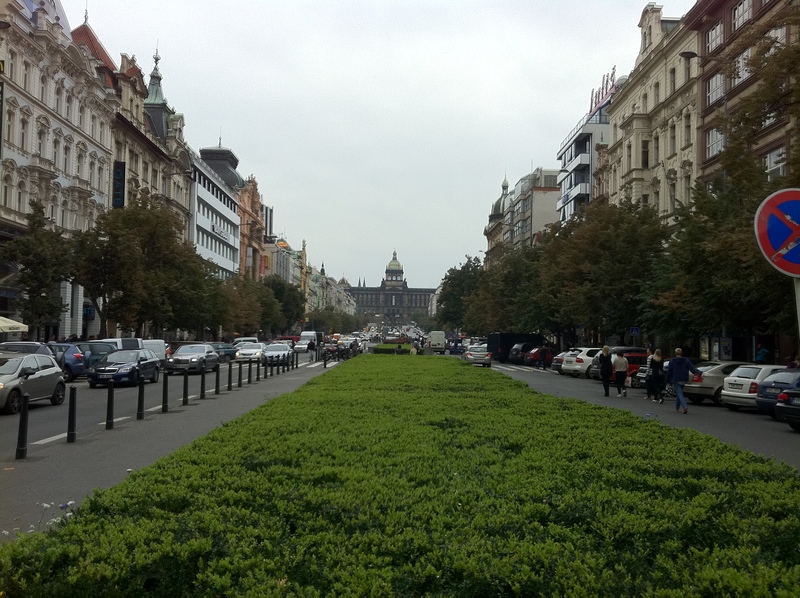 At first glance, Wenceslas Square always strikes me as a comparitively unremarkable place in Prague, when there are so many treasures to witness eveywhere else. Of course there is the imposing Museum at one end and the statue of Good King Wenceslas sitting proudly on his horse etc. Lunchtime! 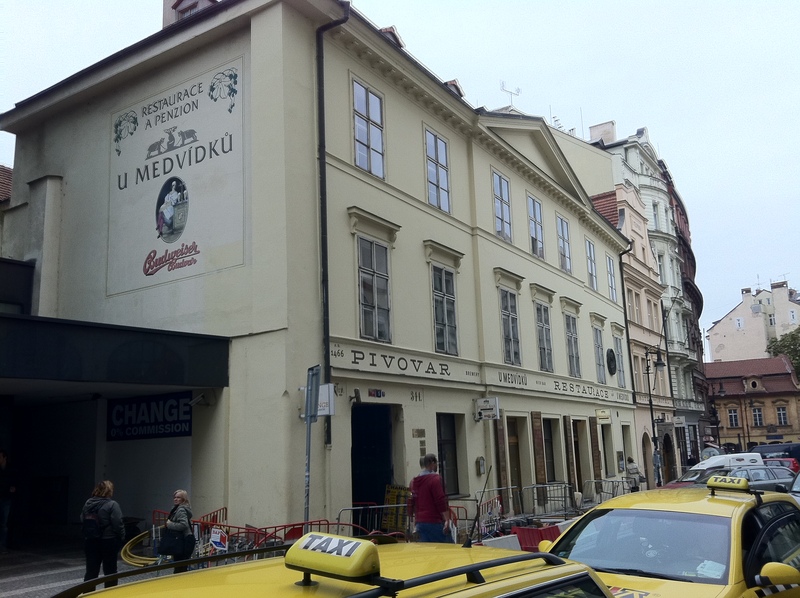 We decided to eat at a famous Prague institution called U Medvidku. 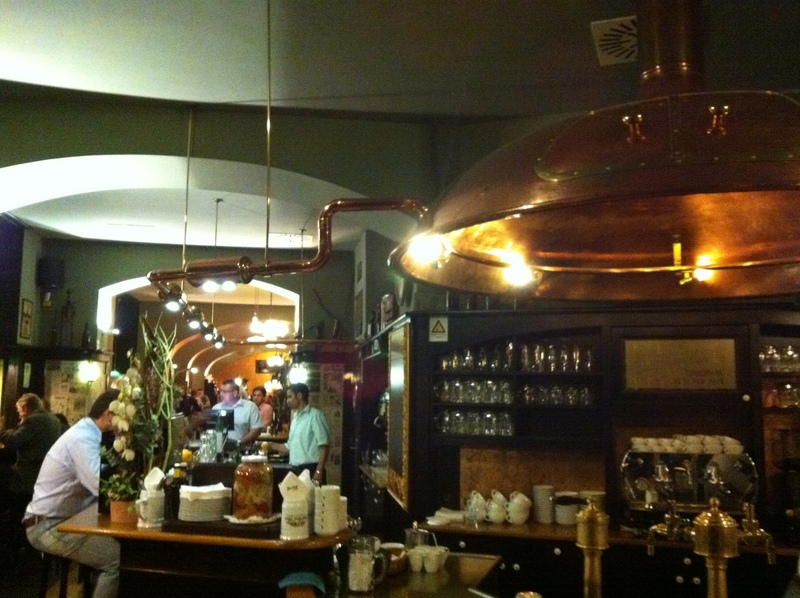 This old establishment brews it’s own beers on the premises and serves good hearty traditional Czech national dishes. 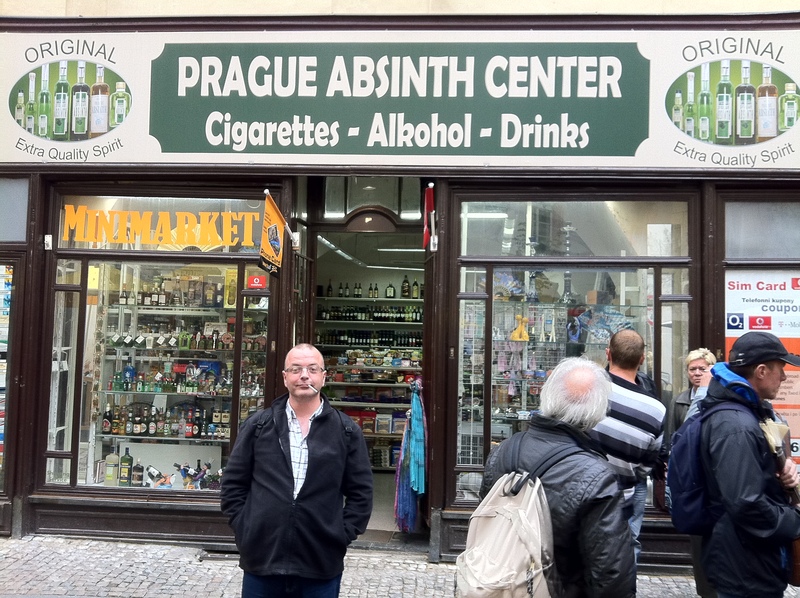 It has been a particular favourite haunt of RLPO members for as long as I’ve been coming to Prague, and before. True to form, there were many othe orchestra members tucking into various dishes, amongst the packed rooms full of locals. I decided on a half of roast duck, on pickled vegetables with a selection of about five different types of dumplings. I will start the diet again as soon as we get back home! My 'duck' is bottom left! 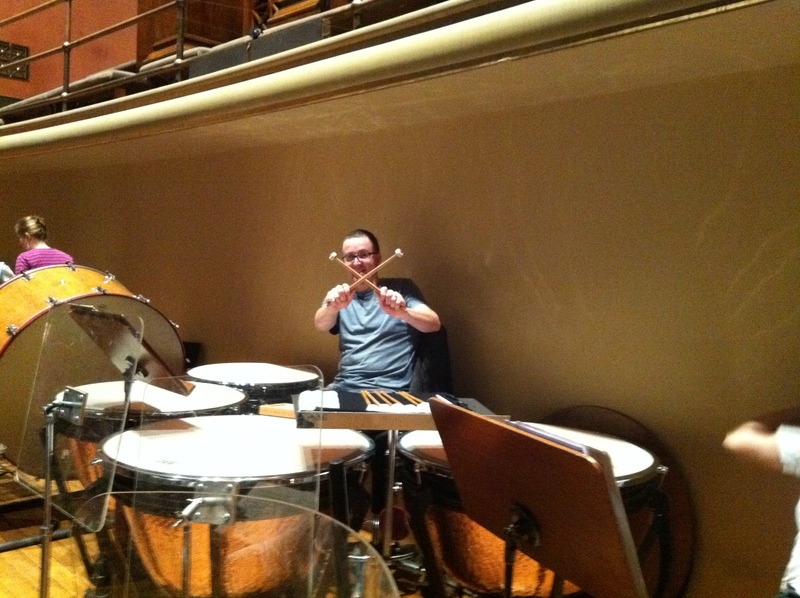 The time had come for the rehearsal, so off we went, back to the Rudolfinum. The Liszt concerto no. 2 for piano and orchestra, was scheduled to be dealt with first. As in Liverpool, Lukas Vondracek was to be the soloist. Vondracek is an exciting talent, and hails from Prague. Could the choice of this virtuoso be a masterstroke alongside presenting Petrenko, from St Petersburg, to the fiercely nationalistic Czech audience tonight? This being the Dvorak Festival, it would be remiss of us not to perform a work by the man himself. We had chosen Dvorak’s ‘The Wild Dove’, also known as ‘The Wood Dove’. This curiosity was written at the end of Dvorak’s life and is a programmatic ‘Symphonic Poem. Careful, Simon Griffiths ( horn) - if you light up there you might blow up the shop behind you! 2) Allegro – Andante. A jovial, handsome young man meets the beautiful widow; he comforts her and persuades her to forget her grief and accept him as her husband. 3) Molto vivace – She fulfils his desire for marriage; a joyful wedding. 4) Andante. From the branches of a fresh green oak, which overshadows the grave of her first husband, whom she had poisoned, the mournful cooing of the wood dove is heard. The melancholic sounds pierce to the heart of the criminal woman, who, tormented by pangs of conscience, becomes insane and drowns herself in the waves. Dvorak was well known to be a pigeon fancier and maybe this fact, with a very judgemental ‘pigeon’ gave him a good deal of pleasure! The rehearsal ended with a brief run through some of the parts of Rachmaninov’s Symphony no. 3, which needed a little balancing to the new accoustic. 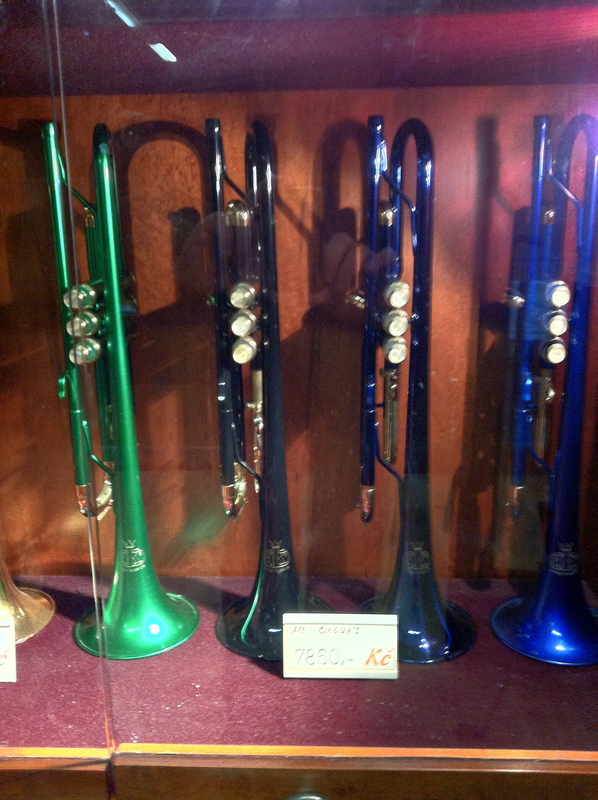 After the rehearsal, I decided to go for a preconcert dinner with the trumpets, trombones and tuba. We each chose a different main course and tucked in. There were various other contingents from the orchestra in this place, including the first violins and the woodwind. All were chatting enthusiastically about the upcoming concert and the happy times enjoyed on this trip so far. 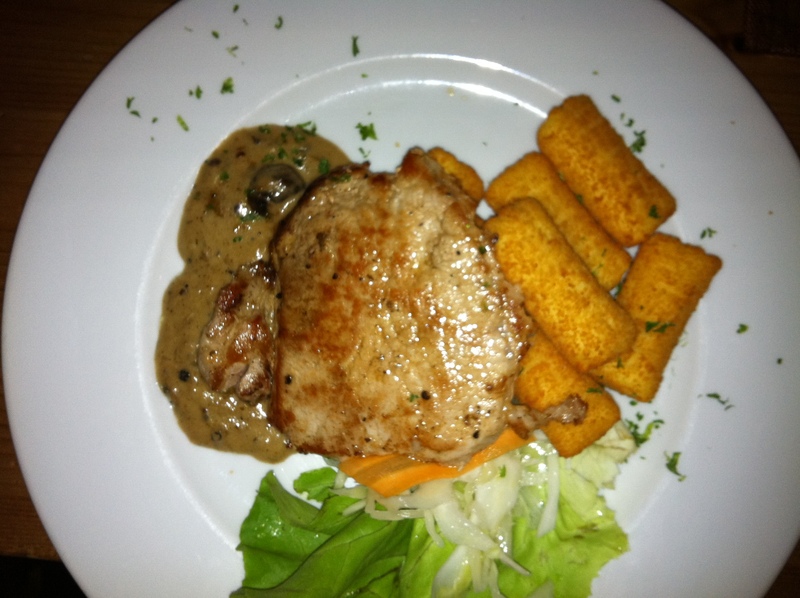 I chose a wholesome pork steak with vegetables as my last hearty meal of the tour. 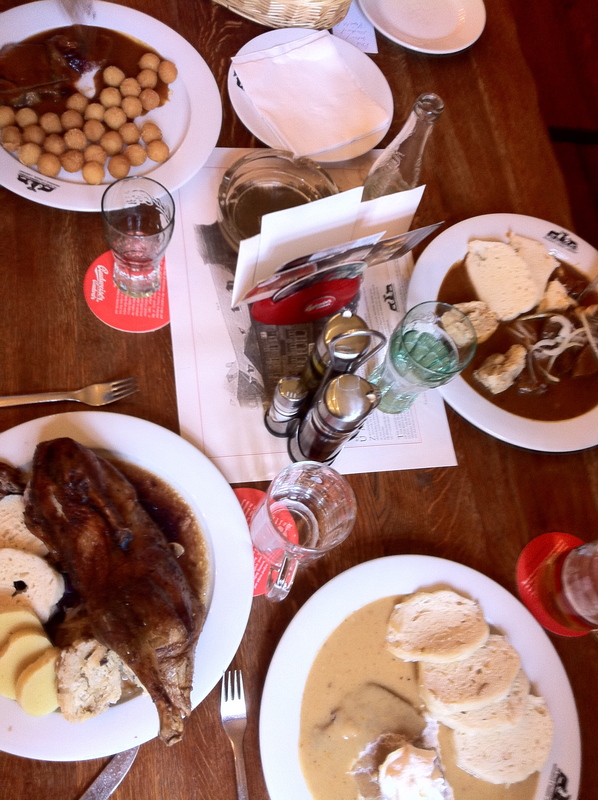 The last supper, in Prague. A pre – concert drink followed. We chose a bar just adjacent to the restaurant. The senior management were in there entertaining some ambassadors or such. 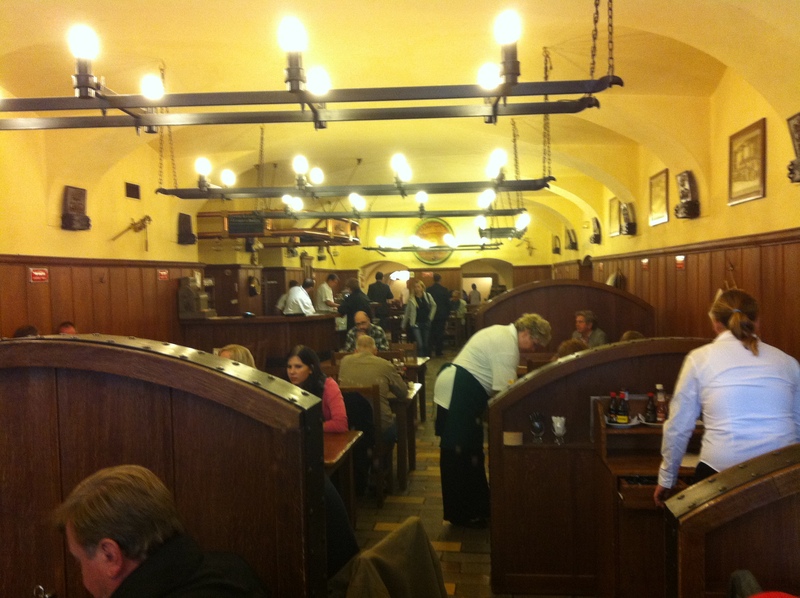 It is difficult to find disappointing places to eat and drink in Prague and this place was no exception. 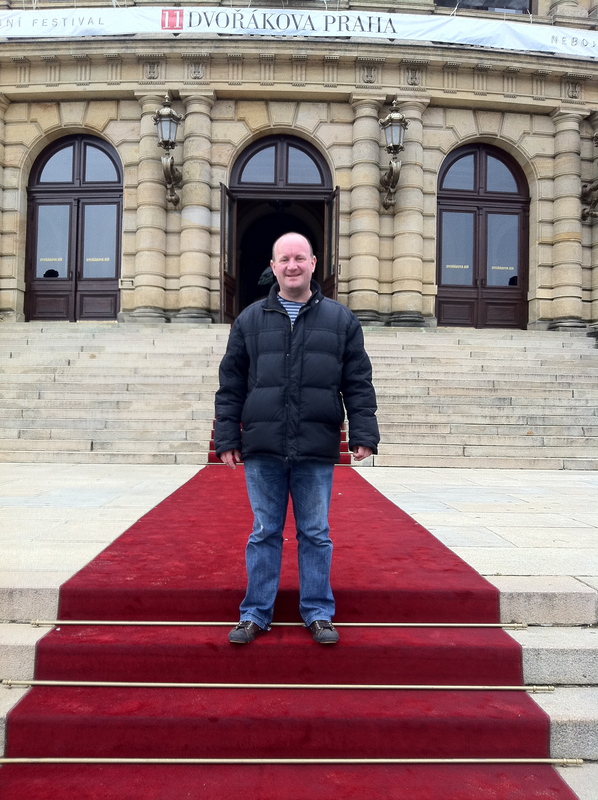 Back at the Rudolfinum, the place was buzzing with activity. 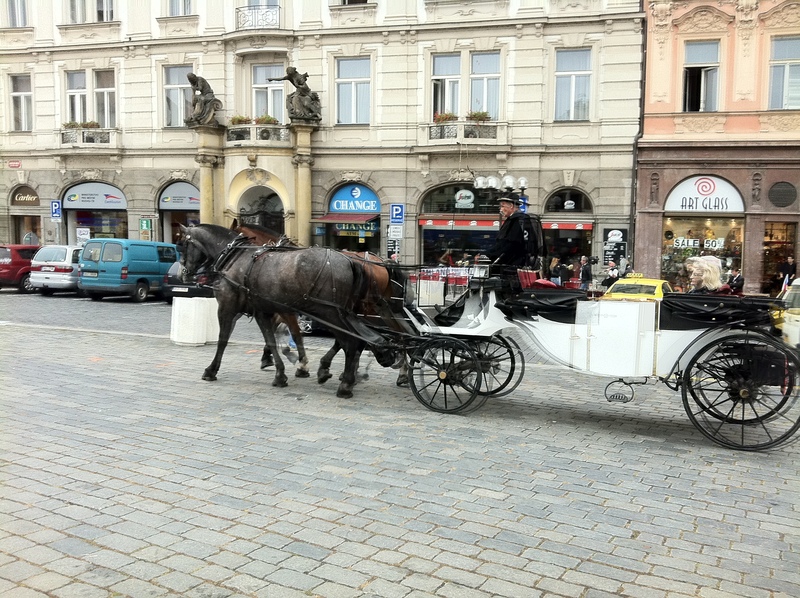 It was nice to see that the Czechs still dress up in their finery for an evening out at a concert. Another full concert hall too. It was a real pleasure to see former RLPO Chief Conductor, Petr Altrichter and his wife arriving to hear the concert. 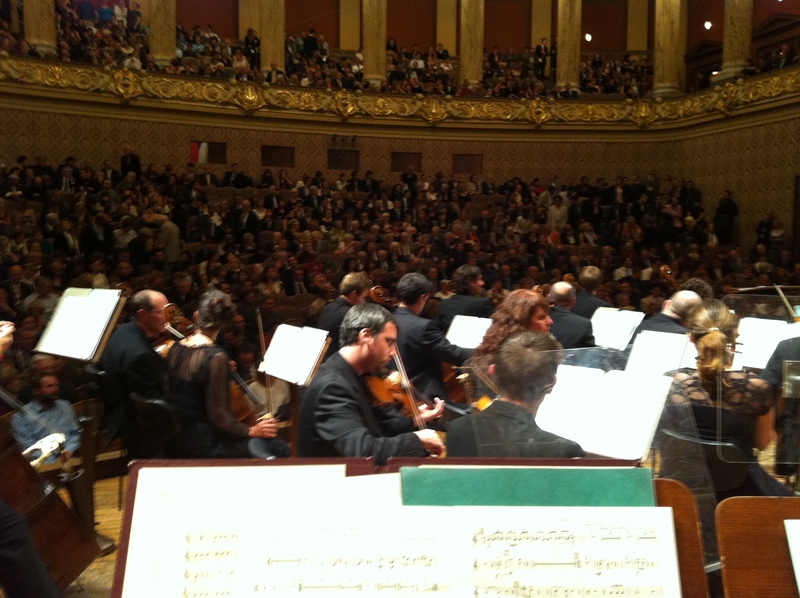 Petr was already in Prague that week to conduct the Czech Philharmonic in a concert at the same festival as us. I was appointed to my position in the orchestra during Petr’s tenure and have consequently always had a soft spot for him. He gave me a massive bear hug and went off to take his seat. Dvorak’s ‘The Wild Dove’ was greeted with a typically enthusiastic response. As I have already mentioned, the Czechs are a fiercely nationalistic people and they take particular pride in any music they feel entitled to call their own. Dvorak is one of their favourite composers. Vondracek powered through the Liszt piano concerto with gusto and panache. The audience loved him. he performed a solo encore of Schubert after the ‘roaring’ crowd brought him back to the stage several times. After the interval, Petrenko was greeted with encouragingly enthusiastic applause. You could then have heard a pin drop before the extremely quiet beginning of Rachmaninov’s third symphony. There was something special about this performance. I think all the meticulous pre-tour preparation, the wonderful time everyone had enjoyed plus the fact that this was the last opportunity for performance, meant that everyone, including Petrenko, was really trying there utmost. The piece was going unbelievably well. At the finish of the last chord, the audience erupted. Success! Petrenko and the Royal Liverpool Philharmonic Orchestra had certainly won the Czech concert-goers over. They insisted on an encore. What better than ‘their own’ Slavonic Dance no.1 by Dvorak. The applause surpassed even that offered for the Rachmaninov! Once the orchestra was on the coach back to the hotel, eveyone was ready for a good end of tour celebration. This started on the coach, the RLPO then took over the hotel bar; the party spread out to the couple of bars by the hotel before finishing up in the hotel bar again! I was now ready for bed. There would be an alarm call at 5.30am for the airport run. I didn’t want to miss the plane… again! 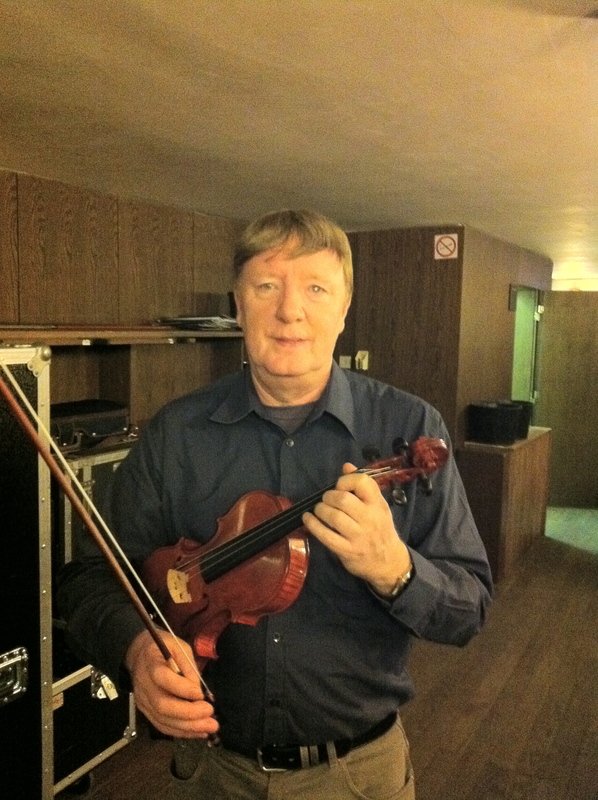 David Whitehead, first violin, in party mood! On the coach to the airport in the morning, many were still dozing. Touring is hard work; it is certainly no holiday, despite much of my writing apparently alluding otherwise. 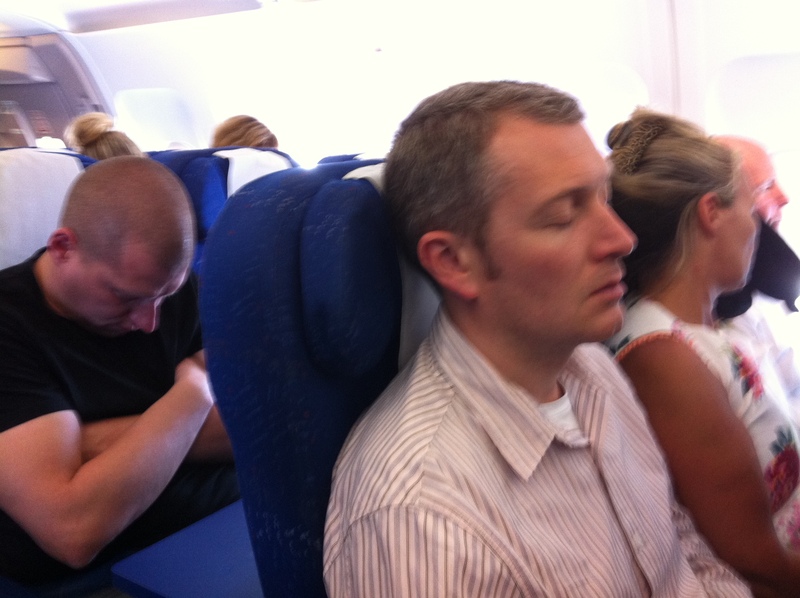 Most people appeared to sleep on the plane to Paris and then again on the connecting flight to Manchester Airport. 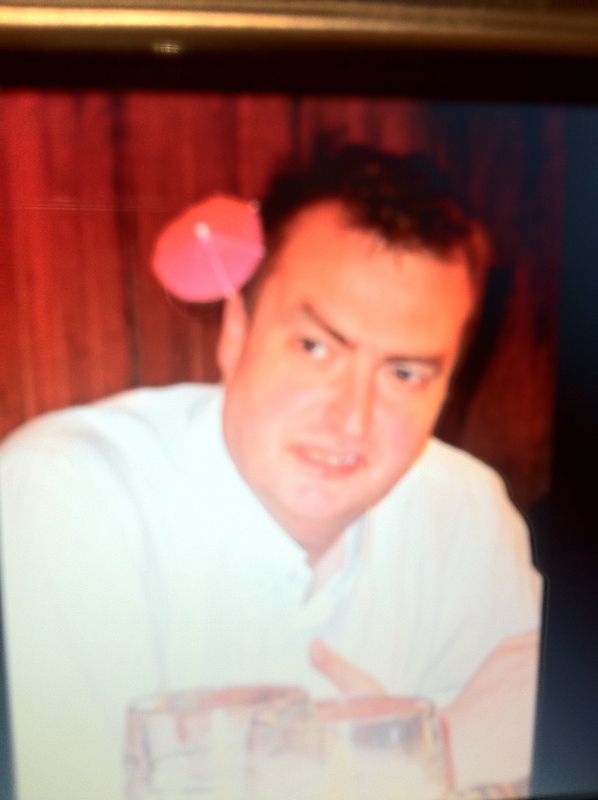 I reflected that this had been a very successful and enjoyable tour. I would remember it on so many levels. Simon Cowen and Simon Chappell (Trombones) catching up on a little sleep! However, home is definitely home and it was with some relief when the coach dropped me back at Liverpool Philharmonic Hall. I was delighted to find that my son, Jonathan (18 years old), had left the house in a perfect state of tidiness for my return. He had moved in to live in my house, with me, whilst I was in Romania. We both went to collect Scooby, who seemed much better after his leg operation (also in my absence). The three of us and his dog minder for the week then went for a good night out. A day off now then Tchaikovsky’s ‘Swan Lake’ in Liverpool on Friday!